I'm searching for some little known hikes in Yosemite Park. Mainly around the valley or towards Glacier Point. Several months ago I found a couple online: a little used route up the Four Mile Trail and another little used trail near Happy Isles that leaves the regular trail near the Vernal Falls Bridge. However I can't locate that information now. Can anyone recommend some unknown, little known, less traveled trails? The Four Mile trail climbs all the way to Glacier Point. From there, you can loop around to Nevada Fall and back down to Happy Isles. It's quite an enjoyable full day hike. You can buy ice cream or a hot dog at Glacier Point -- How many hikes are there where you can stop and buy treats? The stock trail joins the JMT at the bridge below Vernal Falls. It returns to Happy Isles -- just on the other side of the river. I take it often -- quiet, and very few people. A more adventurous short hike with climbing is the hike to Sierra Point. Google it. Here's a good set of pics. It gets to third class several places, and will test your route-finding skills at first. Here's the Cathedral Lakes secret or "back door" access. If you just have a few hours, I have a favorite route into lower Cathedral Lake. It is an abandoned trail, now used only by people who know it is there. But it is half the distance to the lake compared to the JMT. Maybe 1.5 mile, climbing 800 ft.
To find it, check your odometer and drive 1.9 miles east from the parking lot at the east end of Tenaya Lake. (3.8 miles west from the official Cathedral Lakes/JMT trailhead in Tuolumne Meadows.) Stop at the unmarked gravel parking area on the right (south) of the road (hard to see, has space for half a dozen cars). Google maps street view. Follow the use trail southeastward (directly away from the road) through trees and meadow, crossing the old Tenaya-to-Tuolumne trail (easy to miss, barely maintained). Here the trail quickly ascends toward Medlicott Dome. If you check the map, you will see there is a bench at the base of the Medlicott face that climbs gently and heads due south. Continue on this bench following the use trail. You can see it was once built as a trail, but in several places trees have fallen across it. Here are pictures from a hike using this trail, and continuing up past both lakes are here. Parking spot location: 37.860840,-119.434970 <--Interactive Gmap4 map link. Last summer, my bro-in-law and his 5th-grader daughter hiked this route, x-country to upper Cathedral lake, then to the saddle between Cathedral Pk and Echo Peaks. All in a quality day hike, including round trip driving from Fresno. Thanks Steve. The Sierra Point Trail is one I was looking for. Also one called "The Ledges": an alternate route up Four Mile. I'm not sure if my group will attempt either of these. In general we aren't comfortable with too much exposure. But we did hike Half Dome, Whitney, and Angels Landing. And I like your shortcut to Cathedral Lakes but that will have to wait till another Yosemite trip when we are in that part of the park. It's only an hour drive from Yosemite Valley. ...not sure where you could find non-camping lodging any closer. I suppose there is something a step up from camping at Tuolumne Meadows. I am staying at a vacation home in Yosemite West near the Glacier Point Road. It's about a half hour to the Valley. So, your shortcut to Cathedral Lakes is another hour drive from the Bridal Veil Falls area? According to Google maps, from Bridalveil area, 48 miles, 1:15. If you were going to climb Cathedral Peak would you take this "shortcut"? It does not look much shorter than walking from the parking area. To find it, check your odometer and drive 1.8 miles east from the parking lot at the east end of Tenaya Lake. (3.7 miles west from the official Cathedral Lakes/JMT trailhead in Tuolumne Meadows.) Stop at the unmarked gravel parking area on the right (south) of the road (hard to see, has space for half a dozen cars). great suggestion - I may visit this trail either as a warmup hike this summer, or even use it as entry point - but what "Trailhead" permit quota would I need to worry about if going in overnight? This isn't really a trailhead. I never really thought about that, what if I want to start an overnight hike in a place that isn't really quta controlled? Will they just add me to the nearest official Trailhead (Tenaya Lake), even if you don't use that trail and end up somewhere totally different? This would be a great alternate starting point for my summer "High Route," taking the bus to Tenaya from Tuolumne, having it drop us off a the parking lot, and then going into the wild. We're hijacking RenoFrank's topic. You guys should add a hike or two for him here. John, to go up Cathedral Peak, I think it might be farther via the shortcut route, since you would need to circle back on the JMT to where that black line / divide appears on the map above. Fish, I think they would require a Cathedral Lakes / JMT trail head permit, since you would hike to approximately the same camping spots. 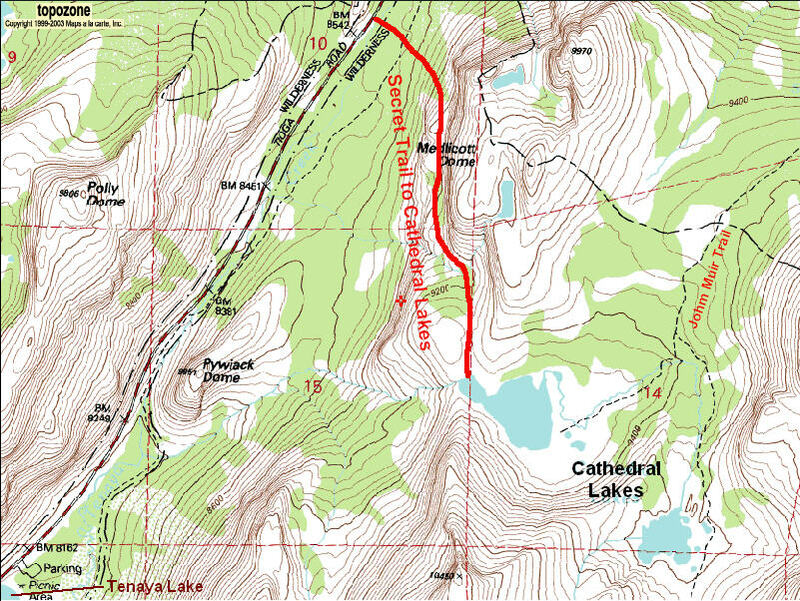 However, since trails connect from Tenaya Lake, the Tenaya Lake / Clouds Rest trailhead could probably qualify. But you might call their wilderness permit office and ask if they have any special "Cross country" permit quotas. Good idea on the starting point for your cross country adventure. Easy solution. We'll probably do the "shortcut hike" on our way home since we plan on taking that road to Tioga Pass then down to 395 and back to Reno. Hopefully the pass will be open. I don't mind the developing discussion towards other topics. Like others (I surmise)I enjoy any and all information I learn from reading the posts. Hey, Steve, isn't that stock trail the original JMT start? And isn't it stock ONLY? Can you enter it at the Happy Isles end, if, say you were a JMT purist of some kind (and also were taking the Shepherd Pass variation, of course) and wanted to tqke the original route? Yes, Salty, you can catch this stock trail from Happy Isles - go past that rockfall exhibit/educational loop trail and head upstream. There's a nice bridge further up. You're right, hikers are not supposed to be on this one. I discovered it coming down the JMT - we "accidentally" wandered past the merge down to the Vernal Falls toilet at the bridge. I don't recall seeing any signs posted up there, but I remember seeing a sign down at the rockfall loop about no hikers or bikes. I guess someone could get "lost" and end up on that trail. The stock cowboys might not take kindly to it if you meet up with them. Not sure if this alternative is the original JMT. It's quieter for sure, but you miss some views of Illouette Falls and Yosemite Falls that you see on the paved highway. We've also seen bears occasionally on the regular route, which is always fun. Really cool shortcut to Lower Cathedral, Steve. I can't wait to check this one out. The main Cathedral Lakes trail always seems like a long slog for a day hike. RenoFrank: Check out Mt Hoffmann from May Lake High Sierra Camp for another great hike in this area. It's in the geographic center of the park and the views are awesome. saltydog, it is likely that stock trail was the original start of the JMT, since it was sure easier to build than the paved section to the bridge. I don't recall seeing any "no hiker" signs. It does parallel a paved road that goes up to the huge steel water tank that likely supplies all of the valley's domestic water needs. Reno Frank: Since you are staying at Yosemite West, you could check the Chilnualna Falls hike that starts near Wawona. On the Glacier Point road, I've hiked in to Ostrander Lake. Sentinel Dome and Taft Point are near Glacier Point -- haven't hiked those, however. Winter snowshoers and xc skiers go out to Dewey Point for a nice overlook. I wouldn't recommend heading up this route unless you go with someone who knows the route intimately. Very easy to get cliffed out up there, and if you're not comfy with exposure, a trail would probably be preferable. And as for signs saying "no hikers", I see signs all over the place that say "no dogs" and yet all sorts of mutts are walking up to Vernal and other areas. Another option would be North Dome. The trailhead/Parking is at the Porcupine Creek (not to be confused with Porcupine Flat, a mile to the west) parking area. Total distance is ~ 9 miles roundtrip. Mostly flat. View of Half Dome is Magnificent. Porcupine Creek is approximately 25 miles east of Crane Flat. Parking is on the right hand side going east. "I wouldn't recommend heading up this route unless you go with someone who knows the route intimately. Very easy to get cliffed out up there, and if you're not comfy with exposure, a trail would probably be preferable." Moose Tracks, which route are you referring to, Sierra Point or The Ledges. Sierra Point doesn't look that bad. Ditto on the North Dome hike! Generated in 0.083 seconds in which 0.066 seconds were spent on a total of 15 queries. Zlib compression disabled.